I already had the ideal fabric on hand – a stretch woven cotton/spandex twill I’d bought from Aliexpress. Like my other Aliexpress orders, I was pleasantly surprised by the quality. The fabric is very smooth and stretchy, so much so that I doubted its fabric content. A quick burn test proved that the fabric was composed as advertised. It was a cold, windy day, so you’ll have to forgive the slightly blurry action shots. Most photos had the pants taking off with the wind! As the fabric had so much give (think bengaline or ponte level stretchy) and the pattern was drafted for non-stretch wovens, I went down a size. Construction was otherwise non-eventful, bar some confusion over the fly front. The fly front is drafted right-over-left as is usual in mens’ clothing, but as I’d only ever worn and sewn left-over-right fly fronts I changed the orientation. I also cut the pocket facings from self-fabric to maintain the stretch, and finished the waistband with a hook and bar/snap combo rather than a button to reduce bulk. I’m really happy with how the pants turned out. 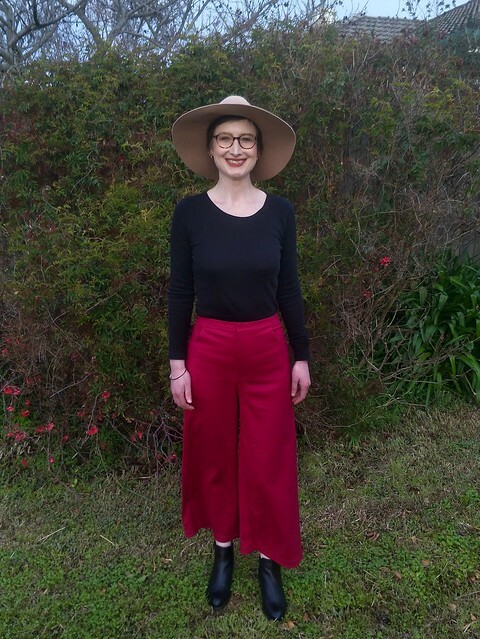 With some extra length added by want of a hem facing rather than the turned-up hem, they are just the right length for a cropped pant. The stretchy fabric made fitting easy, and the pattern itself is well-drafted with thoughtful style elements. Pattern details: “The Wide Leg Pant is a high waisted pant with fly front and button closure, shaped waistband, back darts and curved pocket. 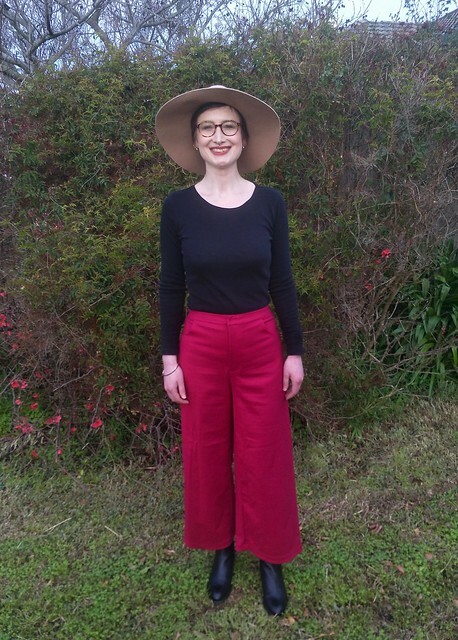 The pants are drafted to be fitted around the waist and hips, before dropping into a wide legged, slightly cropped pant.” Available as a free PDF download from Peppermint Sewing School in sizes A-J (hip 84-139cm). Fabric: 3m x 132cm wide cotton/spandex stretch twill. Colour 18 Red. Weight 220g. 95% cotton, 5% spandex. From Aliexpress. These are adorable! Yours are sewn beautifully! I can’t wear zip. But I saw Gillian (Sewcialist) show how to over ride that with elastic waist! I may have to try these and do that! For my tummy troubles, the higher the waist the better- but no droopy crotch! LOL! Plus size RTW used to have waist room with crotch at your knees! ack! These would work really well with an elastic waist. Now I’m feeling like I missed an opportunity to make them even comfier! As long as they’re comfortable for you, I think they’re a total win! The fit is amazing and the colour is fantastic. This shape looks great on you! It looks so good I’m putting this pattern on my list. Thank you! I hope you make them, it us a great pattern. Love these! Thanks for pointing out the free pattern. I’ve been agonizing over exactly which wide-legged pattern I was going to try. Free makes the decision easy! It does! And to be perfectly honest, this pattern has far better drafting than some of the more expensive wide-legged pant patterns out there. I love these, however I feel like I’ve kind of achieved this with my latest Lander hack so I think I will be hard pressed to push myself to print this one off! Yours look FANTASTIC though. You have nailed the style with your Landers! Don’t you have that voice in the back of your head saying, it’s new and shiny…..try it!! Actually that voice doesn’t exist for me much at all and hasn’t for most of my life. I too much of a “proud to be different” person that I am a legendary late adopter as a result. The only reason I am ever even vaguely on trend is when the trends coincide with what I love! Okay, this may be dumb, but how did you change the fly? Just cut all the front pieces out backwards? 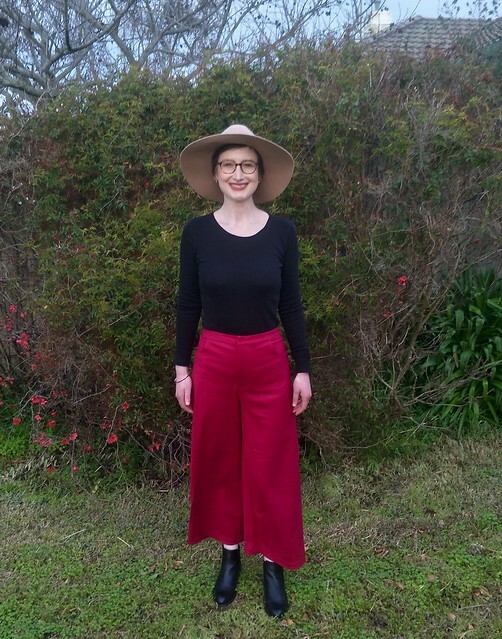 I’ve muslined these pants three times for fit adjustments (ugh, short front rise) and have been procrastinating cutting out my fashion fabric, but I am now thinking this is what I was waiting for! Pretty much, you just cut the fly and fly shield flipped over. Then reverse the instructions!